My RedState post on the ‘Establishment’ win at the RNC. Found here. Short version: the RNC managed to use the base’s anger at the ‘Establishment’ to successfully justify not changing a rule in a way that would limit the ‘Establishment’s’ power. …It was EPIC, really. RNC to test out campaign, outreach infrastructure this month. I’m noting this because I want to get on the record: do not panic if the rocket blows up on the launch pad. The RNC is testing this stuff out a year early precisely because it might blow up. Negative data is great data. And you want to do this early In 2012 Team Romney went live with its infamous GOTV platform ORCA on Election Day. Guess what happened? That’s right, it blew up on the launching pad. With Team Romney inside of it. PS: Looking at the article, the specific states targeted appear to be specific test beds for specific strategies. I wouldn’t read too much into what states got excluded at this particular stage of the process. For all we know, the next wave will test stuff in safe Democratic or Republican states, or look at other battlefield states, or just go national and see how things scale. If you know what you’re doing, how long it’s going to take, and how much it’s going to cost, it’s not exactly R&D, is it? It’s official: @reince is in for a third term as RNC chair (congrats, btw). I am incredibly humbled and honored to have the opportunity to serve as RNC Chairman for a third term. After the 2014 cycle – which hopefully fixed everything that went wrong during the 2012 cycle, or at least fixed everything that could be fixed by the RNC* – well, if Reince Priebus still wanted the job he was going to get it. He still wanted the job. So he got it. He’s a good guy; I like him. And I bloody well expect him to make sure we win in 2016, too. *I suggest that we don’t let the campaigns run the GOTV/data stuff on their own anymore. Let the national committees do that. Reince Priebus may have the votes to stay on as RNC chair. This probably shouldn’t surprise anybody. Reince Priebus says he has votes to win history-making third term as Republican National Committee chair. http://t.co/n3aXi0r7YY. We had a great election cycle. We had, in fact, an election cycle where we exceeded expectations on pretty much every front. It’s reasonable to think that people may be unwilling to mess with that when there’s a Presidential election coming up. RNC convention pick bearing fruit: LeBron James to return to Cleveland. Hey, if the President can take credit for Osama bin Laden, then Reince Priebus and the RNC can take credit for bringing LeBron back to Cleveland. I don’t make the rules, after all. I just use them to be a royal pain in the sit-upon. Four years after he bolted from Cleveland to Miami in pursuit of the N.B.A. championships that had eluded him, LeBron James is returning home. At age 29 and with two N.B.A. titles now in his possession, James decided Friday to rejoin the Cavaliers, for whom he played in the first seven seasons of his storied professional career. Thank God: the 2016 GOP convention will be in Cleveland, OH. I got nothing against Dallas, but Texas gets hot in the summertime. And Cleveland is a nice, respectable, straightforward choice. We are going to be running the Mother Of All A Return To Normalcy campaigns in 2016: there is a time for drama and there is a time for no-drama, and this is a time for no-drama. Via Hot Air: I’m surprised that they didn’t use this video. 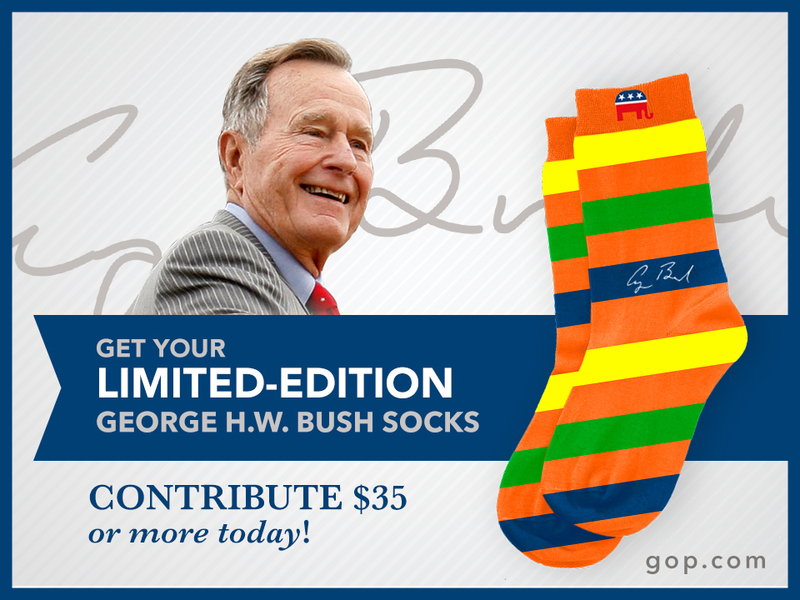 The OMG YOU NEED TO GET THESE GEORGE HW BUSH SOCKS post. I rarely give money to politicians or political committees: frankly – and false modesty be damned – my in-kind contributions are more valuable to the Republican party than my cash contributions would be. 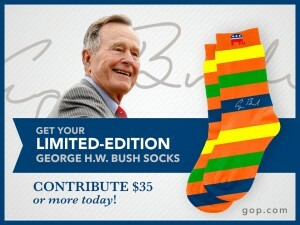 But I absolutely had to have these socks. Mind you, the RNC should have had a widget for this already. But that’s a quibble. QotD, Take These Changes In #RNC Debate Policy Seriously edition. …the party fully intends to change its debate structure. The reason goes beyond Republicans’ belief that holding 20-plus debates, as in 2011-2012, provides too much opportunity for gaffes and intra-party bloodletting. It also stems from GOP dissatisfaction with debates in which the moderators don’t seem to understand the premises of modern conservatism and engage in hostile or clueless questioning — or out-of-the-blue provocations like former Clinton operative George Stephanopoulos’ queries about contraception at a 2012 debate in New Hampshire. Just what the RNC will do is not yet clear. But it is serious. Look for real change to occur before Republican presidential candidates meet again. I should note, by the way, that this has to be a dynamic process. We’re going to have to go in and check the system every four years. RNC formally resolves to make CNN/NBC choose between Hillary Clinton & primary debate access. Whatever cuts down the number of debates, frankly. The Republican National Committee unanimously passed a resolution here Friday to not partner with NBC or CNN on 2016 primary debates if they air Hillary Clinton projects. RNC Chairman Reince Priebus got an extended standing ovation from cheering state chairmen during the party’s summer meeting for spearheading the push. Reince Priebus to CNN, NBC: drop the Hillary propaganda films, or lose primary debate access. The head of the Republican Party threatened Monday to cut out CNN and NBC from the GOP presidential primary debates if the networks do not shelve their plans to air lengthy features on Hillary Clinton — who is widely expected to be a Democratic candidate in the 2016 election. Republican National Committee Chairman Reince Priebus accused both networks of trying to put “a thumb on the scales” of the 2016 race with programming he claimed would be tantamount to an “in-kind donation” to the Clinton campaign. I happen to have a real problem with Priebus’s decision, here. It’s a touch squishy: I mean, the chairman seems to be suggesting that he’d still let the RNC credential NBC/CNN flunkies if their parent companies don’t abandon their brave new roles as Hillary ’16 harbingers. This is no time to go wobbly. PS: You may safely assume that I – and a lot of my compatriots – will not be unhappy to see our 2016 debate calendar hacked down to something that’s actually useful. By any means necessary.